Spring is just around the corner, or right behind the next snowstorm. The groundhog says we are in for 6 more weeks of winter. Pleasant thought, right. With spring rapidly approaching it is time to start looking around your home and property and making plans for any kind of improvements you are going to make. With the economy still rebounding I'm sure you will want to choose projects that will bring the best results for your dollar in terms of adding value to your home. Landscape and lawn renovation are usually top concerns with homeowners. These projects can be completed by almost anyone who has the needed tools and is not afraid of a little hard dirty work. Return on your investment is usually pretty high in regards to property value increases, not to mention the personal pride when your friends and neighbors comment on the completed work. Painting and general clean up is another area where a talented homeowner can perform the needed duties with a small investment and some good old elbow grease. Results can be very rewarding from an ego standpoint, not to mention the money saved by doing it yourself. Probably the biggest project that will average over 900% return on your investment is cleaning your roof that has become infested with ugly black algae and mold streaks. This is definately NOT a project you want to tackle yourself. Roof cleaning is best left to the professionals at Qwik Roof Cleaners. For a complete story on why you DO NOT want to attempt this project yourself, read my blog on this site entitled "So you think you want to clean your roof yourself". It is very educational as to all the things involved in roof cleaning. If you still think you want to try doing it yourself, May God bless and protect you, and make sure your insurance is paid up. If your eyes get opened to contracting with a certified professional roof cleaning company, Call Qwik Roof Cleaners, Louisville Ky. at 502-773-1730 for a free no-obligation quote on our Certified Roof Cleaning services. It will be the best decision you have made this year in making your home stand out in your neighborhood. 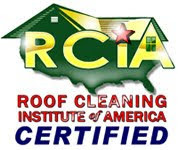 Is your roof cleaner really certified?